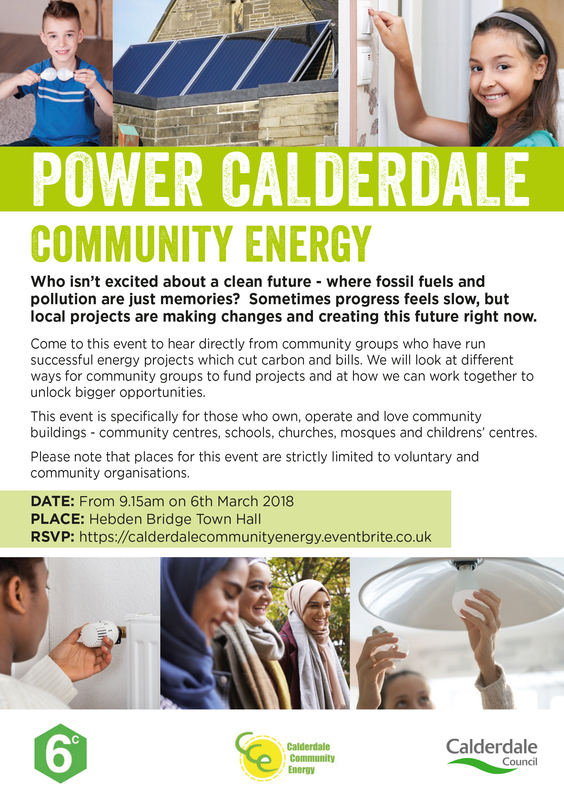 Calderdale Community Energy is holding an event at Hebden Bridge Town Hall specifically for those who own, operate and love community buildings– community centres, schools, churches, mosques, and children’s centres. Who isn’t excited about a clean future – where fossil fuels and pollution are just memories? Sometimes progress feels slow, but local projects are making changes and creating this future right now. At this event, which takes place on Tuesday 6 March, 9:15am-1pm, you will hear directly from community groups who have run successful projects. We will also explore how we can work together to unlock bigger opportunities. The event is FREE but places are limited to just voluntary and community organisations. To book a place please go to the Eventbrite page: https://calderdalecommunityenergy.eventbrite.co.uk. This event will include lunch.